Washington, DC, January 28, 2015 – Today, Congressmen Earl Blumenauer (OR-03) and Chris Collins (NY-27) introduced the bipartisan Cider Industry Deserves Equal Regulation (CIDER) Act. The Act, HR 600, would amend the section of the tax code that deals with wine and related beverages, 26 USC § 5041, to support the growing number of craft and entrepreneurial cider makers, and tailor IRS rules to reflect variations in craft ciders across the country. During the fermentation process, a variety of factors can lead to small changes in the composition of a cider’s alcohol content and carbonation. Because of the narrow way that hard cider is currently defined in the tax code, these small variations can lead to cider being taxed at a rate fifteen times higher than what the statute clearly intended. The Blumenauer-Collins bill would update the tax definitions to greatly reduce the chance that improper taxation could occur. The bill would also broaden the definition to include both pear and apple ciders. "Confusing regulations and contradictory enforcement of rules is the name of the game for startup and experienced cidermakers alike,” said Nat West, owner of Reverend Nat’s Hard Cider in Portland. “The cider industry is growing astoundingly fast, with Oregon and the Northwest being a hotbed. With clear regulations and a tax structure that mirrors the real world of this agricultural product, we will expand quickly and make ciders that people want to drink." The changes proposed by Congressman Blumenauer and Collins will update the existing federal definition of cider to better reflect the industry and keep American cider competitive in the international marketplace. Production nationally has been robust, more than tripling from 9.4 million gallons in 2011 to 32 million gallons in 2013. Cider revenues in the U.S. have been just as impressive, tripling from $178 million in 2007 to $601 million in 2012. "We are very pleased that Congressmen Blumenauer and Collins are working to assist cideries--not only in our part of the country, but nationally as well,” said Sherrye Wyatt, Executive Director of the Northwest Cider Association, which represents cideries in Washington, Oregon, Montana, Idaho, and British Columbia. “These Main Street small businesses are ready to expand their capacity to keep up with strong demand, create jobs, and become a key component of the country’s economic recovery. With tremendous growth, it's an unprecedented time in the Northwest cider industry. We need to remove any barriers which may prevent cider from realizing its greatest potential and write a new chapter in history." Rep. Blumenauer will be addressing the 2015 Cider Convention on February 6th in Chicago. There are 4 Wine Guides in Germany: Gault Millau, Feinschmecker, Eichelmann and Falstaff. These are all annual guides, which are released around November/December. The Eichelmann guide uses stars to rate winemakers. The best producers get 5 stars in the Eichelmann WeinGuide. Interestingly, the list of winemakers from Baden is relatively long in the Eichelmann ranking and the list of winemakers from the Pfalz extremely short. The following wine regions do not appear in the list below, i.e. there is no winemaker with 5 stars: Mittelrhein, Saale-Unstrut, Sachsen, Hessische Bergstrasse. Interestingly, elsewhere regarded as superstars, Weingut JJ Prüm and Weingut Egon Müller from the Mosel region, both known for their ultra-premium sweet style wines, are not in Eichelmann's 5 stars group of winemakers. During the Germany-South Wine Tour by ombiasy (2014), we had two long luncheons at 1 star Michelin restaurants: At Röttele's Restaurant im Schloss Neuweier in Neuweier and at the legendary Restaurant Schwarzer Adler of Fritz Keller in Oberbergen. 2013 Franz Keller Silvaner "Alte Rebe"
Nicolas Thienpont makes a number of Bordeaux wines, ranging from petite chateau wines to classified growth wines, as Owner, Managing Director or Consultant of the estate. David Suire is his right-hand man. 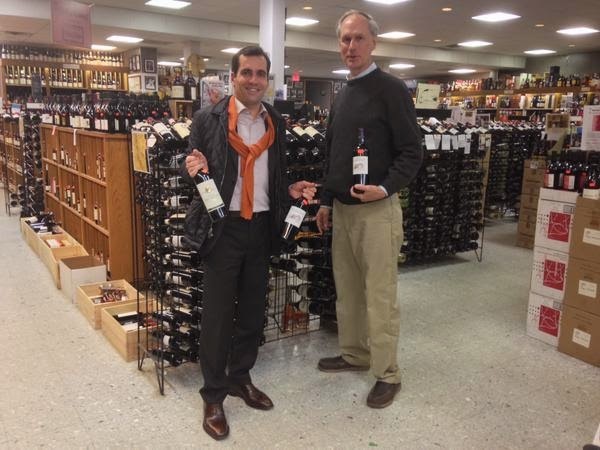 David came to Washington DC, USA, to present to us some of the wines he and Nicolas are involved with. Annette Schiller, ombiasyPR and WineTours, and I enjoyed the informal wine tasting with David very much. At times, there was quite a crowd but there were also moments were Annette and I could talk with Mark Wessels, Managing Director of MacArthur Beverages, and David about what is going on in Bordeaux, in terms of the vintage, new restaurants, the upcoming primeur tastings and other right bank wine issues, etc. ahead of Annette annual Bordeaux Wine Tour by ombiasy coming up later this year during September 15 to 24, 2015. Anyone who know the Thienponts, probably know more than one of the family. There are a dozen or so wine makers and wine traders in the family. I have shortly referred to the 3 most prominent ones (in addition to Nicolas) below. Initially, Nicolas Thienpont, did not seem destined for a career in viticulture. He studied law and philosophy, but turned to winemaking in the 1980s. In 1983, he undertook his first vinification at Chateau Puygueraud and from 1985 he assisted his cousin Alexandre at Vieux Chateau Certan. At the end of 1994, the Corre-Macquin family asked him to take over the management of Chateau Pavie Macquin, a Grand Cru Classé. In 2002, Nicolas became Managing Director of Larcis Ducasse. Chateau Pavie Macquin, Premier Grand Cru Classe B (2006) St Emilion – managing since 1994. Château Larcis Ducasse Grand Cru Classe St Emilion – managing since 2002. Château Beauséjour Duffau-Lagarosse Premier Grand Cru Classé B – managing since February 2009. Chateau Berliquet Grand Cru Classe St Emilion – managing since 2008. Chateau Pavie Macquin Premier Grand Cru Classé B (2006) – managing. Château Bellevue – managed until 2007. Château Les Charmes Godard – owning since 1988. Château Puygueraud – co-owning (family) since 1946. 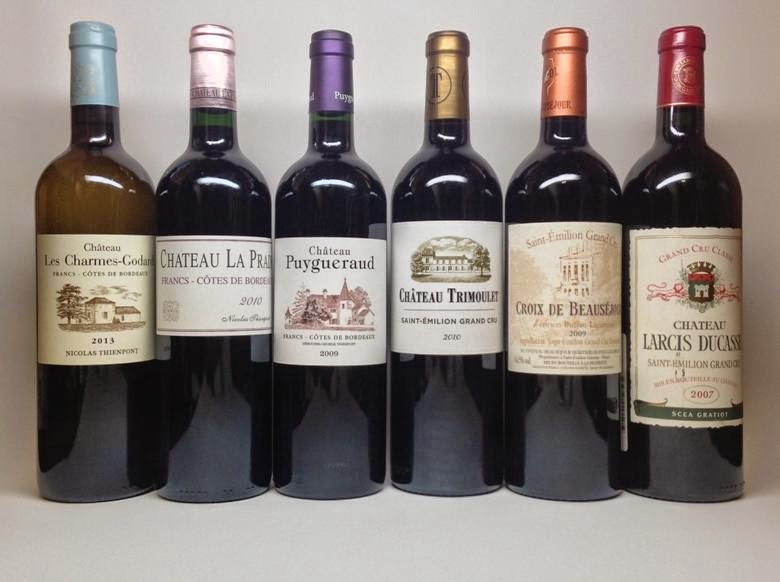 Château La Prade – owning since 2000. Alexandre Thienpont studied oenology and became director of Vieux Château Certan in 1985 as natural heir to his father Léon, but also as natural heir to the Thienpont ‘s common heritage. Jacques Thienpont took over the wine trading business, a company founded by Kamille Thienpont in Hof te Cattebeke, in Etikhove in 1842, in his uncle’s stride. He purchased Le Pin in 1979. Francois Thienpont worked a few years in the US, in wine distribution in Texas. In 1985, he came back to Bordeaux to oversee the marketing and sales of Château Puygueraud’s wines. François created Wings in 1995. The company distributes the Thienpont family property wines and also represents lesser known châteaux. David Suire is from the Cognac region. He studied winemaking in Bordeaux and graduated with a Diplôme National d'Oenologue in 2002. Nicolas Thienport picked him from university and David has been working with Nicolas ever since. The estate, which was bought by Nicolas Thienpont and his brothers in 1988, produces both red and white wines. In the Charmes Godard white, it is both the predominance of Semillon and the winemaking techniques (barrel fermentation and lies contact) that give the wine its richness and good supporting acidity. Its aromatic complexity is due to judicious blending with Muscadelle and Sauvignon Gris. 70% Semillon, 15% Muscadelle, 15% Sauvignon Gris. Château La Prade was bought by Nicolas Thienpont in 2000. Situated in the commune of Saint Cibard, the vines are planted partly on a limestone plateau and partly on clay/limestone slopes and it is the complexity of these terroirs that gives the wine its subtlety and elegance. 4.3 hectares. 90% Merlot 10% Cabernet Franc. The property was acquired by George Thienpont in 1946. Since 1983, Nicolas has been managing the estate. Chateau Puygueraud has since become the benchmark wine for the Cotes de Francs and a reference for the renewal of this still little-known appellation. 35 hectares. 55% Merlot (no more Cabernet Sauvignon with effect from 2005) 25% Cabernet Franc 15% Cabernet Sauvignon 5% Malbec. Chateau Trimoulet has been owned and managed by the Jean family since 1802. 7 hectares. 60% Merlot, 35% Cabernet Franc and 5% Cabernet Sauvignon. Aged in 75%, new French oak for 12 months. Nicolas Thienport has been consulting starting with the 2011 vintage, both in the vineyard and the cellar. Château Beauséjour, formerly fully titled Château Beauséjour Duffau-Lagarrosse, is ranked Premier Grand Cru Classé B in the Classification of Saint-Émilion wine. The Croix de Beauséjour is their second wine. When the historic estate in its entirety came to Pierre-Paulin Ducarpe, it was divided in 1869 between his two children. The son inherited the half which was sold in 1924 to Dr. Fagouet, altering the name to Château Beauséjour Dr-Fagouet (present day Château Beau-Séjour Bécot) and his daughter who wed Doctor Duffau-Lagarrosse, received what became Château Beauséjour Duffau-Lagarrosse. The vineyard area extends 7 hectares with the grape varieties of 70% Merlot, 20% Cabernet Franc and 10% Cabernet Sauvignon. The Gratiot family has owned Château Larcis Ducasse, a Saint Emilion Grand Cru Classé, for over a century. 2002 was the first vintage produced by Managing Director Nicolas Thienpont. Stephen Tanzer, www.wineaccess.com (May 08) 89-92/100: Moderately saturated medium ruby. Aromas of black fruits, coffee and mocha, with a whiff of cherry liqueur. Then sweet, round and soft, with noteworthy depth to the black fruit, mineral and licorice flavors. Finishes sweet and long, with ripe, suave tannins and very good breadth. Serious, complex, stylish wine with plenty of shape and energy. Find us on: Facebook| Twitter| Instagram| YouTube| Pinterest| Google +| Yelp! Thanks David for swinging by. This little corner in the back of MacArthur Beverages has seen quite a number of prominent winemakers before your tasting, including, for instance, Henri Lurton from Brane Cantenac and Ernst Loosen from Dr. Loosen.